I first stood before the painting titled The Song of the Lark sometime after I reluctantly drove my youngest daughter to Chicago. “Mom, I have to do this,” she said in defiance to the 9/11 terrorist attacks. In retrospect, letting her go led me to the Art Institute of Chicago. There, a large painting of a young peasant woman standing in an open field at sunrise, caught my eye. She’s heard the lark’s song and paused midstride with her mouth parted, face uplifted. I found another kindred spirit, pondered the artist’s meaning of the lark’s song and sickle in her hand. As years passed, this stunning work of art became mine, clear and true, a prophetic image of whom I was becoming. When I walked into my developing lavender fields to weed and harvest, I paused in awe of the new day and birdsong. Long before my discovery of Jules Breton’s beautiful work, Willa Cather, one of America’s foremost female authors, experienced a similar kinship with the portrait. Many readers consider The Song of the Lark Ms. Cather's most autobiographical novel, the story of a young artist’s awakening against the backdrop of the western landscape. We see and hear again the theme of the lark’s song. Thea Kronborg, the protagonist, arises from her inextricable connection to the land with strength to become what she meant to be—an opera singer. If the influence of Breton’s barefooted peasant seems limited to writers, think of Eleanor Roosevelt. In 1934, admiringly, she announced The Song of the Lark America’s most popular painting. The Chicago Daily News sponsored the nationwide contest. Unawares, he wandered to the art institute, walked in and found Breton’s peasant before the sunrise. " I've always loved this painting…and thought, ‘Well there's a girl who doesn't have a whole lot of prospects, but the sun's coming up anyway and she's got another chance.’ So I think that gave me some sort of feeling that I too am a person and I get another chance everyday the sun comes up." Dear Reader, my husband and I drove our daughter home from Chicago one starlit night a year after I left her there. She wandered a long season before she found her place. Meanwhile, the sun arose each morning—always, our foremost, faithful prospect in a cloud of misery. Hope. 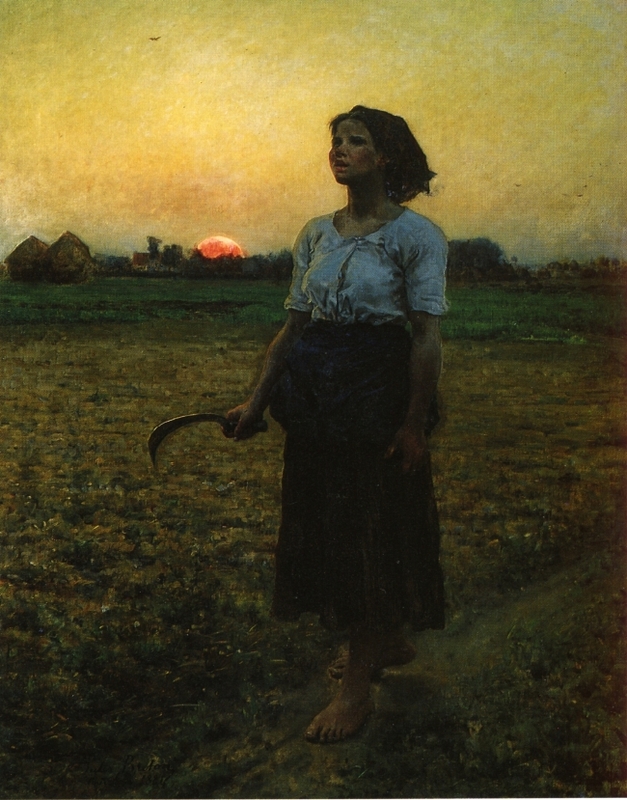 I believe Jules Breton understood this saving power of God’s morning light. A man who knew suffering and loved his native French countryside, he heard the lark sing.